Consecrated by Archbishop Maximianus between 547 and 548 AD, the Basilica of San Vitale is proof of Ravenna’s importance during the age of Emperor Justinian. An absolute masterpiece of Early Christian and Byzantine art, in 1996 it was inscribed in the UNESCO World Heritage List. The prestigious American online magazine, Huffington Post, described San Vitale as “one amongst the 19 most important holy places in the world”. The church has an octagonal plan and is formed by two bodies; the inner one is surmounted by a dome supported by eight marble-covered massive pillars. Its architectural values are essentially tied to the chromatic qualities of its mosaics that cover the walls, the presbytery, and the apse, filled with biblical, symbolic, and historic references. The political values of the building are tied to these mosaics as well, with the emperor and empress depicted at the foot of Christ. There are also religious ties in the constant reaffirmation of the truth in Orthodox worship, sanctioning the defeat of Arianism in the city with the end of Theodoric’s government. Still, these are known wonders in every latitude. But also the Basilica’s floors hold many, lesser known, surprises. There’s the simple 8-pointed North Star, repeated multiple times and not only on the floor. Then there’s the so-called “labirinto dell’anima” (labyrinth of the soul). It is embedded in the floor of the presbytery, right in front of the altar; composed of seven spirals, it was once considered a symbol of sin, while passing through the labyrinth represented the way to purification and finding the way out was an act of re-birth. Hence, this is a place of a thousand splendours, where, ever since the eighteenth century, oratorios, sonatas, symphonies and motets resounded and still resound. Then in 1961 the Basilica became the permanent location of the International Organ Music Festival, the first and oldest festival of this kind in Italy. 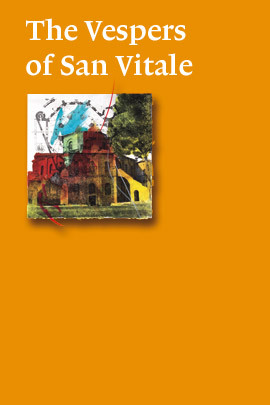 San Vitale has served Ravenna Festival, from the start, as a fundamental reference point within a journey tied to spirituality.